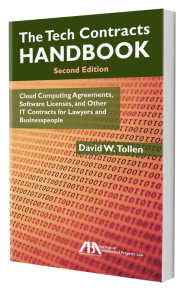 A South Carolina Law Review article cites The Tech Contracts Handbook — and in fact relies upon it heavily. The article is THE UNDERCOVER DETECTIVE LOOKS AT DATA BREACH CONTRACT CLAUSES: WHO SHOULD BE RESPONSIBLE UNDER THE CONTRACT FOR COSTS OF COVER? (67 S.C. L. Rev. 535, Spring 2016). The author is Professor Jill Bronfman of U.C. Hastings. It’s an excellent article, and it cites the book fourteen times. For those who don’t know, the major school law review article is the acme of legal research and writing: one of the most peer-reviewed and widely respected media for the legal profession. So we’re honored to see the book cited. The article’s author, Professor Bronfman, recently joined Sycamore Legal, David Tollen’s law firm, as Of Counsel. But that’s more or less a coincidence. The article was published in the Spring of 2016, and the research took place earlier, or course — more than a year before Professor Bronfman and the firm discussed collaborating.